Following studies conducted in several countries, the Canadian results suggest that 28% of Canadians fit the definition of Potentialists. Potentialists lead lives that are personally fulfilling and rewarding, including the pursuit of enriched world travel, starting new hobbies, and spending an increased amount of time with their families. 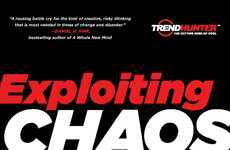 The rise of potentialists is driven partially by the economic downturn, which has prompted many to reconsider their priorities… All this fits very well with Jeremy’s book, Exploiting Chaos, which suggests that times of chaos cause people to rethink their needs. If you’re looking to capitalize on those changes, or spark a revolution, make sure to check out the book, which is currently the #1 Most Popular book at CEO Read.